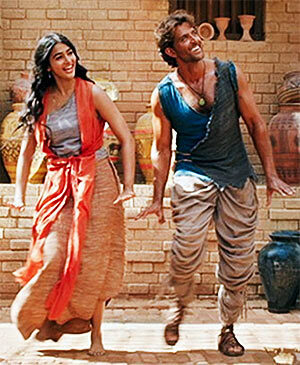 Rediff.com » Movies » Mohenjo Daro Review: A 155-minutes long fancy dress competition! Mohenjo Daro Review: A 155-minutes long fancy dress competition! Mohenjo Daro takes too long to get there and feels even longer than the time that’s passed, feels Sukanya Verma. The highly publicised crocodile of Mohenjo Daro appears right in the beginning. And the outcome of his underwater duel with Hrithik Roshan, SPOILER ALERT, akin to a man riding a seekh-inserted meat, sets the tone for the rest of the movie. In Ashutosh Gowariker’s version of Indus Valley civilisation, Mohenjo Daro is one definite set, in hues of brick, and all its inhabitants are competing in a grand fancy dress competition. While the tacky, CGI-aided aerial view stresses on the vastness of the region, things are regrettably modest on zooming in. Inside this restricted space wander men, merchants and rulers in thwabs and togas, Viking helmets and dervish caps, tunics and vests, fur-trimmed jackets and Egyptian costumes, cargo pants that cannot decide between harem and jodhpuris, machine-stitched garments masquerading as hand stitched, jewellery that’s a staple of Janpath boutiques and staffs befitting a wizard. The most conspicuous among them is a leading lady who could pass off for a curio shop. The same problem that plagued the villagers of Gowariker’s Oscar-Nominated Lagaan -- tax and a tyrannical ruler -- repeats itself here in the garb of Kabir Bedi, demonstrating there’s a good deal of savagery left in his raging hazel eyes. There’s a lazy attempt at creating a primitive tongue but realising it to be as atrocious as it sounds on screen, Gowariker wisely sticks to Hindi. Except Preeti Mamgain’s clunky dialogue is jarringly engineered in the name of authenticity. History in Mohenjo Daro is tokenism at best. I don’t find that shocking. The trailer was an unsubtle disclaimer. What I refuse to forgive is that the makers don’t even have the decency to have fun with it. At best, it could have played with the premise; make it entertaining and compelling by going all out as an epic, fantasy or adventure. Eventually as the film progresses, or should I say drags, it’s obvious the crocodile is the only bit of thrill Mohenjo Daro has to offer. Gratification like A R Rahman's soundtrack, no longer a consolation, comes belatedly and briefly in a dramatic climax, vaguely reminiscent of Noah’s Ark. In this giant bore which squanders three fourth of its duration over a cloying romance, an antiquated screenplay is the only thing that comes close to ancient -- where boy meets girl, falls head over heels in love and gets her attention by taming a bunch of loose wild horses. So much for the latter’s 'Sindu Ma Ki Krupa Ka Prateek' status, where she’s heralded as some kind of a Goddess of fortune idling about town preening daftly. Perhaps former Miss India Pooja Hegde was chosen for the role because of her experience with the crown -- there’s nothing else she lends to the film. She wears the exact same dazed expression whether kissed or bereaved. Wish there was more of Hrithik and his hallucinated lamb-unicorn cross instead. As for Hrithik, he starts out like the inquisitive Prabhas of Baahubali keen to explore the titular town only to reprise his vendetta-seeking, native home-deprived, Agneepath character Vijay Dinanath Chauhan in a prehistoric avatar of gaon Mandwa, er, Mohenjo Daro fame. Still, the actor tries valiantly and visibly to make sense of it when inspiring the masses like Bhuvan/Mohan (he’s Sarman and it rhymes!) to unite in face of crisis or combating growling giants in dreadlocks and cavemen clothing. But his intensity feels out of place in Gowariker’s loony setup. It’s the film that lets him down and not the other way round. If it is history you are looking for, just go watch the second episode of Shyam Benegal's Bharat Ek Khoj. Or revisit my tongue-in-cheek listicle on what you can learn from it. Because the film takes too long to get there and feels even longer than the time that’s passed.